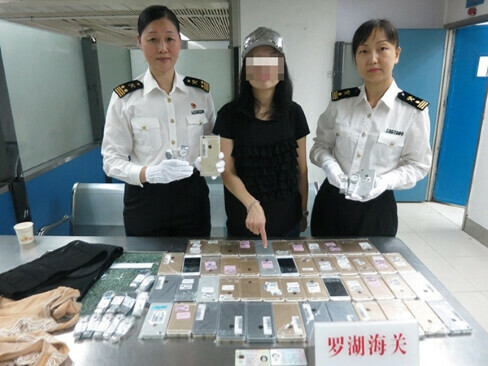 A woman has been caught trying to smuggle 102 iPhones from Hong Kong to mainland China. According to the reports, she strapped them to her torso and tried hiding them with extra layers of clothing. The woman tried passing through the border on June 30, around 8:00 PM. According to the customs officers that detained her, the weather was hot, but the woman was wearing a knitted sweater on top of her t-shirt. Also, her arms and legs looked relatively slim, but her torso was disproportionately wide. Sure enough, when customs officials made her go through the metal detector, the alarm activated. The suspected smuggler was then searched, and customs officers found no less than 102 iPhones and 15 luxury Tissot watches strapped to her upper body. The total weight of all the smuggled goods was 40 pounds. Customs officers were surprised to find so many smartphones strapped to the woman's body and said that this is the most they've ever seen. The attempt is even more impressive, considering the woman managed to add a little extra with the Tissot watches. This isn't the first attempt to smuggle iPhones from Hong Kong to mainland China. Apple's handsets are much cheaper in Hong Kong, and one could make quite a lot of money if they don't get caught. Back in January, a man was caught with 94 of Apple's devices, taped to his body in a similar fashion. It is unknown how many smugglers don't get caught every year. She tried for to many at one time smh. 15 luxury Tissot watches, that's an overstatement. Tissot is far from a luxury brand. 40 pounds? If she do this on a daily basis she'll never need to hit the gym any time soon. Just sayin'. This post has been up for ages and no isis/samsung joke to be found? Wierd, very very wierd! Your spelling is weird too. And I can't even handle having 2 phones in my pockets.